Add in the coloured sashes, our wedding arch or our big Love Sign letters. Bungarribee Pavilion at Nurragingy Reserve sits at the highest point in the reserve, over looking the lake and gardens. 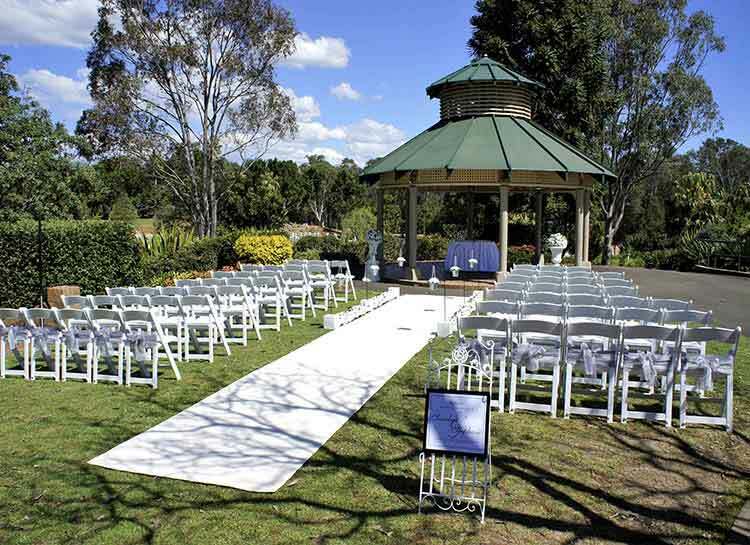 A short walk up the hill from the Colebee Centre, Bungarribee Pavilion is accessible by the wedding bridal car only by arrangement with Blacktown City Council. All guests need to make the short walk up the hill to the wedding ceremony venue. The wedding ceremony aisle at Bungarribee Pavilion runs towards the pavilion. There is ample space to create a beautiful aisle using our range of wedding hire decorations or you can go with our wedding ceremony package as a pre-styled option. Being a good sized space our 9m x 1.5m ceremony aisle runner is perfectly suited to the garden area and the width of the aisle means there is more than enough room to walk without hitting any of the ceremony aisle decorations. When considering your aisle decorations, Adorable Wedding Concepts have a number of options available. In our Elegance wedding ceremony package we have included your choice of Shepherds hooks with Crystal Lanterns, Coloured Buckets with floral arrangements or our Rose Floral Balls. All of these arrangements perfectly compliment the low lying floral rose beds that line the ceremony aisle. The 24 wedding chairs included in the Elegance package will fill the space nicely but you can request to upgrade the chair numbers at the time of booking. The wedding ceremony signing table is set up under Bungarribee Pavilion at the end of the ceremony aisle. Here the bride and groom will be shaded on particularly hot days and it makes a lovely setting for photos. If you want to add a special touch to the look of your wedding ceremony package, Adorable Wedding Concepts have a big Love Sign that’s perfect as a prop both during the ceremony and at the end for group photos. Adorable Wedding Concepts have a fantastic relationship with the people at the Colebee Centre and such we’ve created a special wedding ceremony package for brides and grooms who book the Colebee Centre for their wedding reception. The specially design wedding hire package is very competitively priced and includes a lot of great features. If you are looking for a reception venue, the Colebee Centre caters for wedding receptions of up to 200 guests with secure off-street parking, a choice of several wedding ceremony hire locations, the use of the Nurragingy Wharf and the park for your day and night photos. Canapes and champagne cocktails are served to start the celebrations on the veranda, after your wedding ceremony, followed by a full three-course meal, unlimited tap beer, wine, champagne, soft drinks, juices, tea and coffee, all with full table service. The wedding reception venue includes their famous 12 x metre ‘wall of fairy lights’, linen chair covers, coloured sashes and table centre pieces, a wedding cake, professional DJ, chauffeur driven limousine for the get away and importantly, your own dedicated function manager. We look forward to hearing from you, either call 0418 624 225 or go to our enquiry page and send us an email for an obligation free quote and consultation. Unsure about the Bungarribee Pavilion as a venue? Contact us to discuss the style of wedding and type of venue you are looking for and we can provide you tips and insights from our 15 years of experience in the wedding ceremony industry. Guest Access: Bungarribee Pavilion at Nurragingy Reserve is accessed from the car park next to the Colebee Centre by walking around to the left and up the hill. What you need to know: Nurragingy Reserve allow 1 hour setup prior to the start of the wedding ceremony.